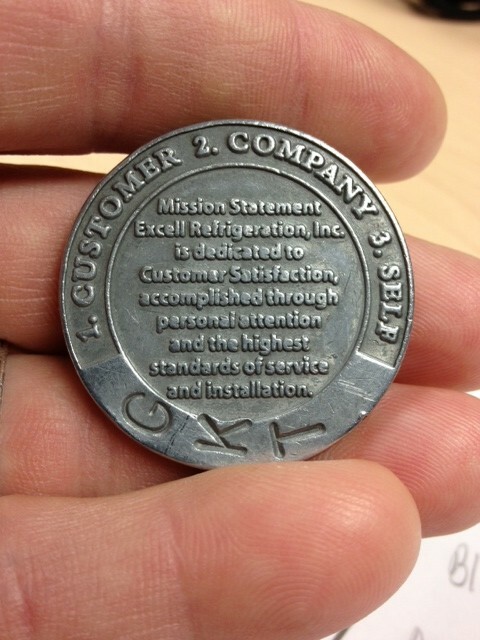 Excell Refrigeration of SC, has prided itself over the past 20 years of being the best refrigeration installation and service company to our region. Over those 20 years we have done little to no advertising other than the signs we have on our trucks and the shirts on our backs. Word of mouth and our reputation has served us well over these years. We have come up with a new way promote our company and ourselves internally and probably externally as well. Challenge Coins for those of you who may not have heard of them have been around for quite a while; I have included a letter with a history and origin of the challenge coin. We have come up with our own Challenge Coin and will be issuing them along with some basic rules that go along with the coin. As we go along we will collect ideas from you and others so that we can build on the basic rules and make amendments. During World War 1, American volunteers from all parts of the country filled the newly formed flying squadrons. Some were wealthy scions attending colleges such as Yale and Harvard who quit in mid-term to join the war. In one squadron, a wealthy lieutenant ordered medallions struck in solid bronze and presented them to his unit. One young pilot placed the medallion in a small leather pouch that he wore about his neck. Back at his squadron, it became tradition to ensure that all members carried their medallion or coin at all times. This was accomplished through challenge in the following manner – a challenger would ask to see the medallion. If the challenged could not produce a medallion, they were required to buy a drink of choice for the member who challenged them. 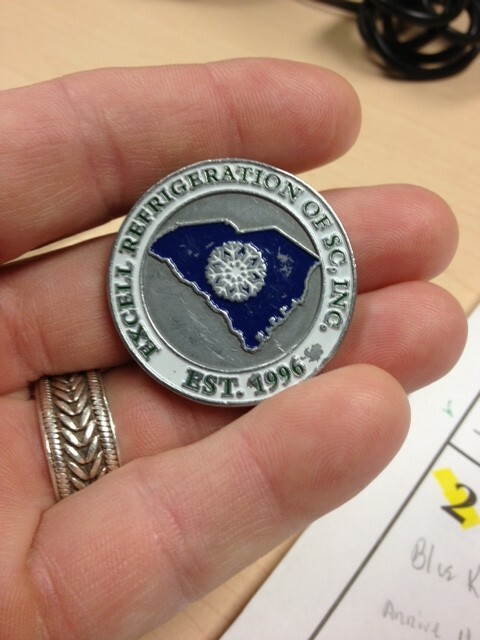 If the challenged member produced a medallion, then the challenging member was required to pay for the drink. This tradition continued on throughout the war and for many years after the war while surviving members of the squadron were still alive. This coin challenge is meant to build and strengthen our company from within. It is also supposed to be fun and to encourage each other with company pride. I truly believe we have the best people in the business and our customers confirm this frequently, when we stop hearing this from our customers we can all turn in our coins. Be an employee of Excell Refrigeration of SC for 90 days. Have an honest desire to provide the Best Customer Service possible. Acknowledge that the coin must be carried at all times. The challenge is initiated by drawing your coin, holding it in the air by whatever means possible and state, shout or otherwise verbally acknowledge that you are initiating a coin check. Another, but less vocal method is to firmly place it on a bar, table or counter, etc. If you are challenged and are unable to properly respond, you must buy a round of drinks, lunch or whatever the challenge is, within reason. If everyone being challenged responds in the correct manner, the challenger must buy a round of drinks, lunch or whatever the challenge is, within reason. Failure to comply with a lost challenge is a despicable crime and will require that you turn-in your coin to the issuing party.